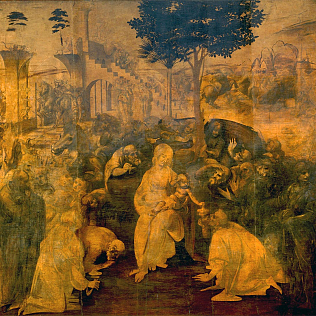 The Adoration of the Magi is an oil painting by Leonardo da Vinci. The master worked on this painting between 1481 and 1482; however, in the summer of 1482, he moved to Milan and he left it unfinished. Even today, the painting owes its beauty and charm to the condition of incompleteness, in addition to the revolutionary composition of the classic scene made by Leonardo. In the fifteenth century the theme of adoration of the Magi was widespread among the Florentine artists, because it gave opportunity to include themes and characters related to the clients, within the representation of the parade. Leonardo took up the lesson of Botticelli, who first represented the scene with a new composition. He also places the Holy Family in the center, and depicts the procession which rotates in a semicircle around the Madonna. Behind her, a space without characters, representing the spreading divine aura. Da Vinci depicts a precise moment, the real Epiphany, which means \"manifestation\": the baby Jesus reveals his divine nature and other people are represented troubled and surprises. As a result, the work appears complex but unitary. What we can admire today is a monochrome drawing, which reveals much of Leonardo\'s artistic technique. The design was his starting point, and it was made very carefully. However, the contour lines were not too clear, in preparation for his well-known sfumato. We also observe attempts, assumptions, as the head of the horse on the left, present in different positions. Because of the progressive \"darkening\" of the work, in 2011 an important restoration started at the Opificio delle Pietre Dure. The work is about to return to his post, at the Uffizi Gallery: must be remembered that even the Leonardo\'s room has been interested in the works for the New Uffizi.